Centsible Savings: Sunday Sustenance - Happy Mother's Day! 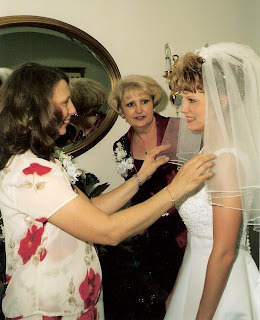 Here is a picture of my mom and my mother-in-law on my wedding day. My mom is on the left and my mother-in-law is in the middle. I am very thankful for these two people and I am blessed to have a godly mother and mother-in-law. First of all, I am thankful for my mom. If it weren't for her, I would not be doing this blog today, because I don't know if I would have known how or cared about trying to shop frugally and always look for the best deal. I am thankful that my mom was a stay-at-home mom who sacrificed a lot to take care of us, and homeschool myself and my siblings. I am thankful that she taught me how and instilled a love and desire to take care of my home - cleaning, cooking, sewing, etc. I am also thankful that I was raised in a Christian home that made sure that I was in church and knew about the things of God. I am the woman I am today mainly because of my mom! I am also thankful for my mother-in-law. She came into my life about 8 years ago when her son and I started dating and let me tell you there are no mother-in-law jokes told here! I have enjoyed getting to know her and enjoyed many shopping outings together. I am also thankful for her willingness to teach me even more about homemaking - in making cakes and decorating my home, and more.. But I am most thankful to her for raising a godly, wonderful man that I now have as my husband! He is a wonderful husband and I am so thankful that he was raised in good, godly home by a wonderful mother that helped make him the way he is today. Proverbs 31 speaks of the virtuous woman and verse 28 says - "Her children arise up, and call her blessed..."
Mom and my Mother-in-law - you are blessed! Happy Mother's Day! I love you both! Feel free to link in and share a comment about your mom and how she has impacted your life. Happy Mother's Day to all you mom's out there! Isn't it so great to have both a wonderful Mom and mother-in-law? My mother-in-law has become a 2nd mother to me during the years of my marriage, and has helped us so much when my parents didn't live near us and weren't able to be there. I hope you had a wonderful Mother's Day, that was a beautiful tribute to your Moms!